And now, to destroy the towns main tourist attraction and namesake! Also, that train looks like something out of Metal Slug, very metal. I actually sort of kind of like some of the paintings in the foreground. I mean I could get used to them eventually. Someone queue up the Legend of Zelda boss music. I feel it might be appropriate here. If I were the crazy painter mage I would paint the grass to be a bit greener (or pinkier). Also what about the plain city walls? People build these walls only for one purpose, that is to put some graffiti on them! Maybe his powers are tied to a place, and have short range? 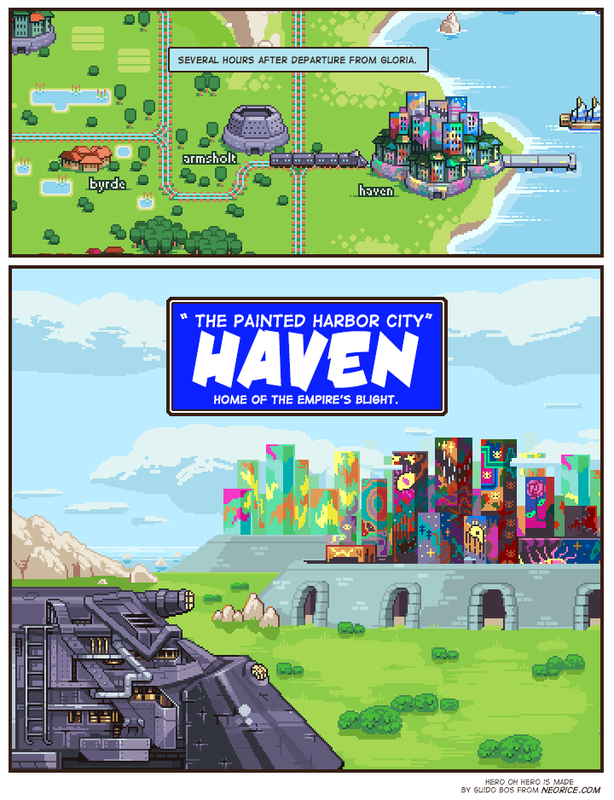 Funny, in the thumbnail on the map the walls around the city are painted, but in the last panel they're not. Haven needs more tentacles. It just isn't horrifying enough. Oh, wait, I could see it being a turtle/squid hybrid with tentacles coming out of the tunnels. That would suffice. Seems to be a deliberate decision. Some of the walls are in between the buildings, yet still unpainted. Or maybe he can only paint inhabited buildings. Nice drawings, mister crazy painter mage. @Saiko on the map, the city walls are painted ! Oh, Haven is a place on...whatever the planet HOH is set on. There is a limit to how narrow a building can be and still be liveable. Even assuming them to be extremely narrow, the dimensions of those building indicate them to be very tall. Given that the whole city is composed of such buildings, and goes on into the background, it must have a rather large population. Given that much of the world seems to be quite low-density, this seems interesting. The next page, at the time of writing this message doesn't contain description nor a comment box!